Major League‘s 25th anniversary meets Draft Day‘s opening weekend, and it got us chatting about the more and less convincing onscreen athletic performances. Remember Chelcie Ross as Eddie Harris, veteran Tribe pitcher and Jobu hater? How old was that guy, a hundred? (Fun fact: he was 47.) We believed he was a MLB starting pitcher almost as much as we bought Denis Leary playing a grizzled NFL coach. But is anybody worse? And does anybody do it well? It really doesn’t matter the sport. He’s convinced us as a baseball player several times, and a golfer. And it’s not just the easy athleticism or the mechanics, but his comfort with lingo and team relationships. We’re sold. Any Given Sunday lacks a lot. A lot. But one thing it absolutely possesses is a realistic athlete in the form of Jamie Foxx. He has grace and skill and his onfield performance is almost enough to compensate for Al Pacino’s screeching. The guy can play basketball. Hustling on a playground or finishing a semi-pro career, Harrelson has some skill on the court. Dunking or not, tell Aunt Bea we said he can ball. He had some big shoes to fill in 42, and not only does he look the part off the diamond, he actually swings a bat and throws a ball with the confidence of a man brave enough to play Jackie Robinson. Sheen’s passion for baseball is well-known, and he took his role as an MLB pitcher seriously. Whether he was throwing just a bit outside or right down the plate, Sheen had pretty smooth delivery. Hell, maybe he Tribe should sign him up. And we’re not talking about Will Ferrell, who put his lack of athleticism to excellent use as a basketball player (Semi-Pro), skater (Blades of Glory), soccer coach (Kicking and Screaming), NASCAR driver (Talladega Nights). Ditto for Will’s buddy Danny McBride, whose casting as a 100 mph fireballer in East Bound and Down is equally ludicrous. No, these are the folks who were wildly miscast as serious athletes. There are a lot of options here. Rob Lowe in Youngblood as hockey player who clearly cannot skate. Or Madonna in A League of Their Own. Or pint sized Michael J. Fox playing basketball in Teen Wolf – sure it’s a comedy, but is it the basketball itself that was meant to draw giggles? There are other real standouts, though. Snipes wins. The guy was forever being cast as an athlete, and though he looked good in a uniform, team sports were clearly not his bag. You might not know it from casual viewings of Major League – yes he made that catch at the wall but notice you never see him throwing – but between The Fan and White Men Can’t Jump, you do. In Mr. 3000, Mac plays an unlikeable, retired hitter planning to skate into the hall of fame on just his career hit total: 3000 exactly. But when an error in the stats reveals he’s short, he goes back to the diamond regardless of the fact that Mac had clearly never held a bat in his life. Usually it’s the throwing motion that gives an actor away, but Mac was so unconvincing at the plate we actually missed the technique of Wesley Snipes. In 1988, Uma Thurman was still unknown, Robert Downey, Jr. was still high, and Anthony Michael Hall was still a 90 pound weakling. So whoever decided to cast him as the number one high school football recruit in Johnny Be Good was clearly sharing Downey’s brownies, because Hall wasn’t just far too small to be taken seriously. He looked like he was playing with his eyes closed. Three years before his breakout brilliance in Psycho, Anthony Perkins played another character with mental illness. Mental illness he handled well. Unfortunately, in Fear Strikes Out, that character – Jimmy Piersall – was also a Major League center fielder. Tee ball players show a more commanding grasp of the game. It’s hard to imagine anyone looking more lost than Perkins looked at the plate, in the field, heck, in the building. 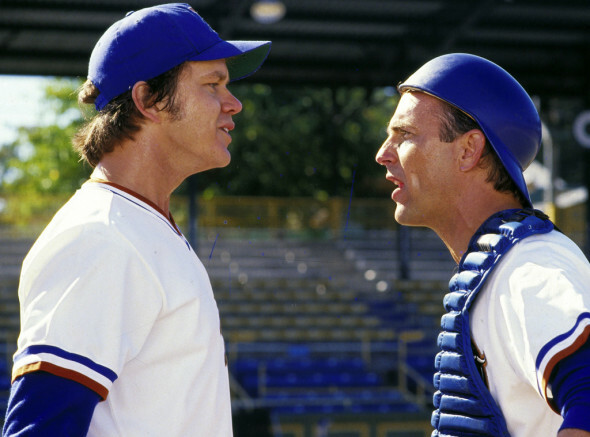 While Bull Durham may be the greatest sports movie of all time, with much of its success due to casting, choosing Tim Robbins to play pitching phenom Ebby Calvin “Nuke” LaLoosh clearly had nothing to do with his presence on the mound. Robbins is a limby, wobbly mess and that was the ugliest windup in sports movie history.